Fife Flyers entertained Coventry Blaze in the first game of the weekend home double header, with the hosts looking to return to winning ways following last Sunday’s 7-2 defeat at defending champions Cardiff Devils and regain the confidence that took them, albeit very briefly, to the summit of the EIHL table for the first time. Both sides played out a cagey opening period, with some untidy passing making the game a rather scrappy affair. It was the visitors who made the slightly better start, and they opened the scoring at 13.02 from Alex Nikiforuk’s snipe from the point on the PP. 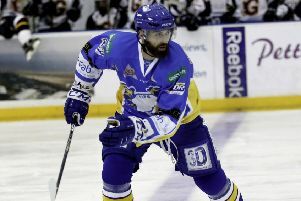 Flyers just simply couldn’t get going in this period, with the forwards having an extremely uncharacteristic slow start that was lacking cohesion, and, as a result, were only able to muster eight shots on the Blaze net, while Shane Owen kept the home side from going into the break even further behind with his usual panache and agility proving crucial. Flyers started the second stanza in much better fashion but the breakthrough still proved elusive, until Brett Bulmer picked up the loose puck and waltzed into the Blaze zone and wristed home the equaliser at 28.52. The goal sparked Flyers into life, and saw them start to put some sustained pressure on the Coventry net. The visitors were able to weather the storm, and could have taken the lead with 0.06 seconds remaining in the period, but Owen was on hand to make a smart pad save from a Ben Lake slap-shot. With the final period delicately poised for a knock-down-drag-out finish, Coventry almost took the lead when Kelin Ainsworth prodded goalwards, but Owen was once again the hero as he made a smart diving save to keep parity between the sides. Fife went on the powerplay after Nicolai Bryhnisveen was penalised for holding, but it was the visitors who took the lead after Lake was neatly played in one-on-one with Owen and was brought down, with Lake dispatching the resultant penalty shot expertly on 46.01. With just over five minutes remaining in the game, the home side found an unlikely equaliser, when Evan Stoflets speculative effort on goal was deflected through the five-hole of Miroslav Kopriva to send the home support into a frenzy. With neither side able to find a last-gasp winner, the game headed into three on three overtime, where once more, both teams couldn’t make a breakthrough. The game was to be decided by penalty shots, and it was Lake who scored the only goal of the shootout to take the extra point back to the Midlands. This was a lacklustre performance of which has not been seen often this season, but it will be one that Flyers will have to forget about, and quickly. That sentiment was echoed by Fife coach Todd Dutiaume, who felt that consistency was key in the outcome of the game. “After last Sunday, we were looking to draw a line under that, and move forward as a group”. “We had an excellent week of training, and then we came out and we kind of dip our toe into the game, its something we have been guilty of this season” he lamented. “Coventry came out hard, and we were under the gun for most of the first period, but we came back into the game, and in the end we got a point out of the game” he reflected. Dutiaume was also keen to get the team back to winning ways instantly when Flyers host MK Lightning in the second home game of the weekend. “Consistency is becoming a bit of an issue, but I hope to rectify that tomorrow” he concluded.